Wong: I cannot "accept my poor life," so I will act as judge and "cut my poor life"
(CNN) -- The suspect in last week's deadly shooting at a Binghamton, New York, immigrant center believed he had been harassed for years by undercover police officers, according to a letter received by a New York television station and purportedly written by that suspect, Jiverly Wong. Jiverly Wong included photos of himself along with a letter, his gun permit, and driver's license. Police said they were studying the two-page letter, neatly written in broken English, to determine its authenticity. 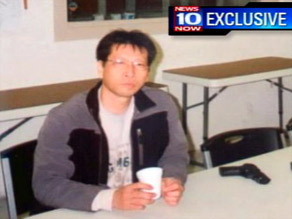 But the package that arrived Monday at News 10 Now in Syracuse also contained photographs of Wong with two handguns, his gun permit and his driver's license. "There's several things in there that indicate to myself and the district attorney that suggest mental health issues as well as there may be some religious connotation," Binghamton Police Chief Joseph Zikuski told 10 News Now, "but until we get a chance to have mental health professionals, have some religious people look at it to determine what it really means, I'm really not going to comment on it any further at this time." Zikuski added that the emergence of a letter from the shooting suspect was not a surprise to law enforcement. The package was postmarked April 3, the day of the shooting at the American Civic Assocation in Binghamton where Wong parked his car blocking a back entrance and entered through the front door, shooting two receptionists and then more people in a classroom. By the time he was done, 13 people -- and Wong himself, killed by a self-inflicted gunshot wound -- lay dead. Four others, including one of the receptionists, were wounded. iReport.com: Is it time for gun control? "I am Jiverly Wong shooting the people," the letter begins followed by an apology that "I know a little English." What follows is details of Wong's beliefs that undercover police had taunted him, tortured him and spread rumors about him wherever he went. The police, he said, forced him to leave California, where'd he'd lived from the early 1990s until 2007, and were trying to force him to leave the country. They entered his room while he slept, he said, watching him sleep, touching him while he slept. And 32 times, he said, police drove in front of him and abruptly stopped. But "I never hit the car," he said. At the end of the letter, Wong complained that he cannot "accept my poor life" and that he assume the role of judge and "cut my poor life." He demanded that an "undercover cop" be held responsible for whatever happened and ended with "You have a nice day."